My newest design the for this pillow crochet pattern is so fun to work up and would look great in any color combination! So, if you’d like to add a fun homemade piece to your home then this is it! 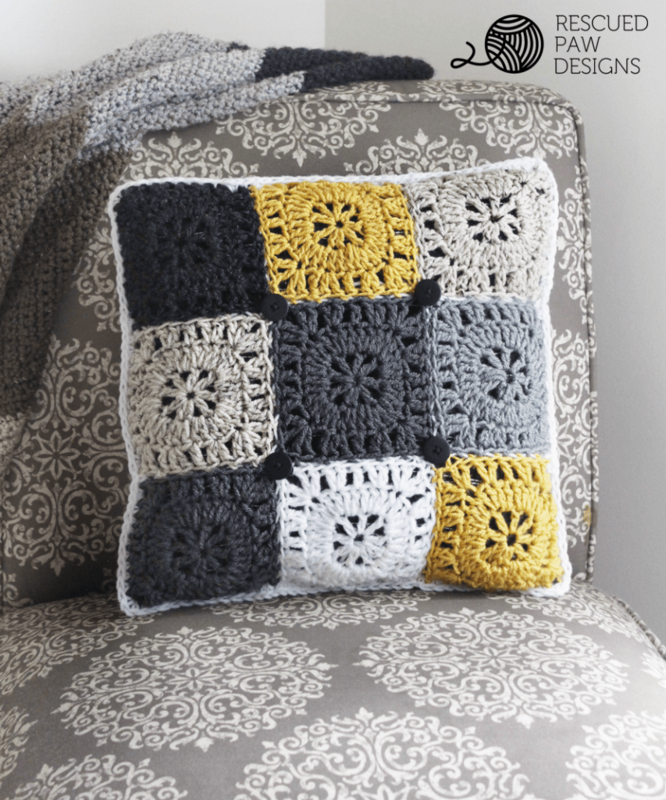 Read on down to find the free crochet pillow cover pattern because why wait to get started! I worked up 9 different color squares and sewed them together with a yarn needle to create the front of the pillow and used one panel of white to create the back! 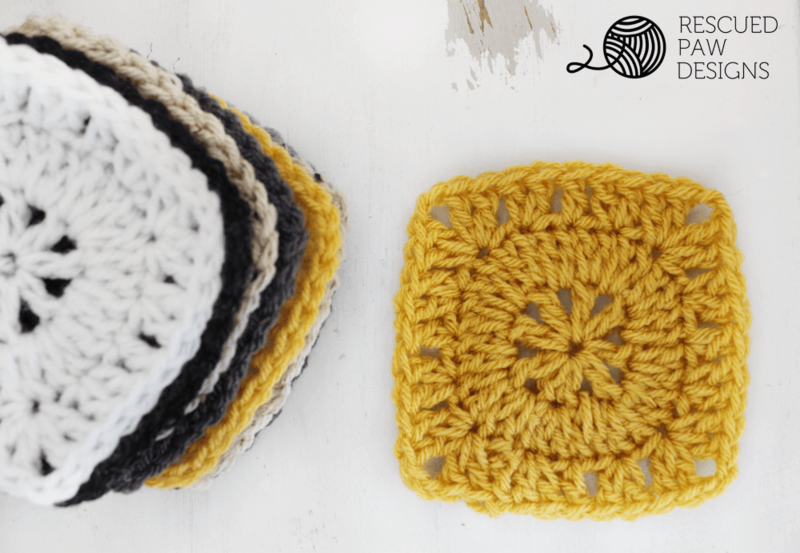 This crochet pillow is super simple and I promise you will want to make more! If you are ready to make this fun pillow cover, then keep on scrolling down for the full, FREE pattern! Scrap Worsted weight yarn (4) and about 80 yards of white. I used Lion Brand Vanna’s Choice in Oatmeal, Silver Grey, White, Charcoal Grey, White and Mustard. You may sell items made from this pattern. If you choose to sell items made from any of my patterns, please link back to me at Rescued Paw Designs for credit. Do not use my photos to sell any items. Thank you for respecting my work. To make the front of the pillow you will need to use my square crochet pattern which can be found here → Simple Square Pattern. Make 9. You may block your squares after you are done if you wish. One Dog Woof has a great tutorial on how to build your own blocking station, which can be found here –> DIY blocking station. Now that the squares are sewn together you now need to attach the buttons (optional) 1 at every corner of your center square. Weave in loose ends with yarn needle. Using white yarn, single crochet along edges of front and back of the pillow while evenly holding them together. Making sure they are both facing the correct direction. In every corner, single crochet, chain 1, single crochet. 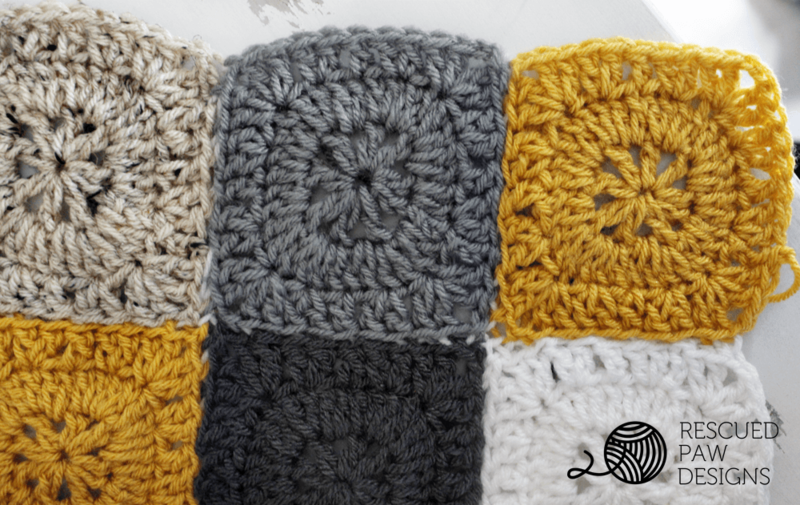 You will make 35 single crochets across every edge. 37 including corners. Make sure to only do 3 sides and then insert your pillow form. Continue single crocheting across last side to finish your pillow. Fasten off yarn and weave in loose ends. I hope you enjoyed this pattern! If you have any questions, feel free to ask. Don’t forget to stop over and check out my new apparel & accessories shop just for makers “Yarn Mamas“. A portion of all sales are donated to animal shelters & rescues. May I copy the pattern. I don’t download PDF or print, because I don’t know how to increase the size of the fonts. I don’t sell anything I make, I give them as gifts or donate them. May I copy a picture of the square. I crochet, but am not sure of myself. I need a picture to go by to see if I am doing the pattern correctly. i would use to stuff the pillow?? Just regular stuffing or…?